Monster Energy Supercross – The Official Videogame 2 [Milestone] – Ouch That Hertz! Most of us are old enough to remember that almost every big movie even remotely related to kids would receive a licensed video game back in the day. Of course, there were some gems, but most of those games were lackluster cash grabs that were made primarily for the crossover appeal to casual gamers. Sure, there are still licensed games, typically through LEGO or the now defunct Telltale Games, but they are not as prevalent. There just seems to be no benefit to making licensed games like that anymore. With that said, there is still one broadly popular licensed genre out there: sports games. 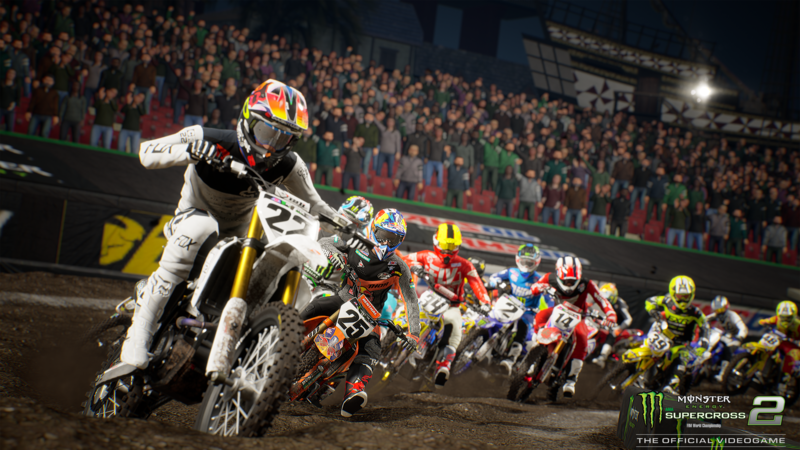 This has led to the title of the game at hand: Monster Energy Supercross – The Official Videogame 2. To save all of us the horror of seeing that name again, I will be using Monster Energy Supercross 2 from this point forward. Let us zoom right into the review! The very first thing the player might notice is just how low-budget everything feels, whi hi is not necessarily a bad thing, especially with publisher/developer Milestone having a history of releasing budget games and pricing them as such. The main menu is something gamers would have seen on most bigger games in the last generation. Not only is it barebones, but the graphics are weak/almost nonexistent, with the main focus being the created rider beside the options. Speaking of which, the character model for said rider is not as smooth as what players have become accustomed to in big-budget AAA games from this generation. Again, there is nothing wrong with this, as long as the player is well aware of what they are getting into. Compared to the other recently released racing game, DiRT Rally 2.0, that has a silky smooth and sleek menu system. In contrast to DiRT Rally 2.0, Monster Energy Supercross 2begins with a tutorial. As a newcomer to the series, I appreciated the fact that the game gave me the option to play the tutorial right off the bat. Returning players from the first game will also be appreciative because they can choose to skip the tutorial altogether. That positive aspect is quickly washed away as the developers – for one reason or another – limit the player’s custom rider’s name options to just eight characters and I am someone with a longer surname. I don’t feel it is smart to break a player’s immersion in the menu before they even get to their first proper race. The rest of the customization options are fine, but do not erase the bad taste of having to modify a rider’s name because their preferred last name is longer than eight characters. Shame on the developer for this choice and I hope they fix it in a patch. Once the player is ready to jump into the actual gameplay, they will have a good number of options to choose from. For single player, there is single event, time attack, career, championship, and compound. The first two are self-explanatory while the next two seem similar at first, and the latter is just a huge training area. The biggest difference between career and championship is the length and progression of both. Championship mode is just one season while the career mode is multiple seasons – with the player climbing up the ranks and becoming more prestigious. I personally prefer career mode because it allows for more progression for the player as opposed to just going through a single season then being over. That said, this career mode was one of the shallowest I have played in my long history of playing sports games, with very few ways to have actual control of the non-race areas of the player’s career. For example, recent NBA 2K games have included dialogue trees during press conferences and other areas. 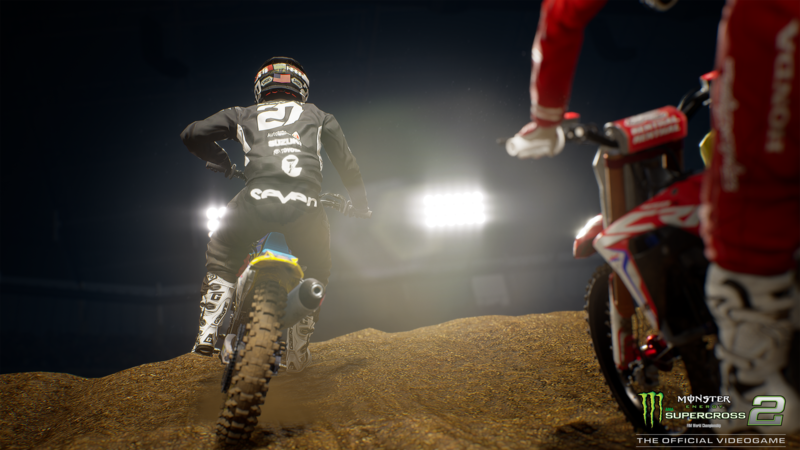 Monster Energy Supercross 2 does not include any of this, instead opting to go for a short animation of the event happening with no player interaction. I will say it is appreciated to have all these different single player options, even if the lone multiplayer mode is barebones with only one game mode. Moving on to the gameplay mechanics, this is where the game ultimately begins sputtering down the homestretch. The controls feel stiff to the point where it is impossible for the player to make minor adjustments. Instead, the player has to move the analog sticks more than needed, and seemingly nine times out of ten, the player is hurtling out-of-bounds or towards wiping-out into a wreck. The feeling of the controls is really disappointing, but when coupled with the track degradation and it just leads to an overall mess. While it is great to see the game incorporate track degradation when it is so crucial to the sport, it is not well-implemented. The degradation is about as stiff as the controls and really hinders the gameplay more than accentuating it. In all honesty,DiRT Rally 2.0does degradation so much better and almost makes it look gorgeous while Monster Energy Supercross 2makes it look like a last generation game. Review copy provided by Milestone.